If there's anything to be said for the biopic of criminally violent Michael Peterson it certainly has divided audiences. Long before production got under way the project was vehemently opposed by Bronson's victims' families and the authorities that had tried to tame him over the years. This opposition was thwarted and the film went ahead regardless. On its release there was certainly no diminishing the controversy as some critics slammed it for glorifying violence, whereas others made comments such as "in all likelihood, considerably more intelligent and interesting than its subject." (Wendy Ide, Times Online). I personally can see both perspectives, but am inclined to agree with neither. The film navigates highlights in Peterson/Bronson's life from teenager into later life, it's hard to pinpoint his age as the film progresses. We are given a relatively linear narrative underpinned with addressed to camera theatrical monologue by the Bronson character and occasional abstractions of Bronson in prison or in the heat of battle with various prison guards. The whole thing begins with a Goodfellas-esque statement that shapes the thrust of the movie. Essentially what we have here with Bronson is a biopic that is more concerned with the persona of the man than getting under his skin. To its credit it does this unashamedly, and I think some critics that slated the film for this surface approach missed out on exactly how self conscious a creative choice this was. In a simplistic narrative the Danish director/writer weaves a visually arresting and stylistic film that tells more about the journey of a man who is clearly a brash and unhinged showman than introspective naval gazing would have. One could read the many depictions of violence in the film as showy or ostentatious but that fits in perfectly with the way Bronson fought and lived (he has now been violence free for ten years apparently). 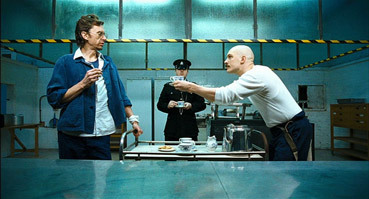 This mode of representation has been allied to A Clockwork Orange and it's not hard to see why, the comment on violence in Bronson is an amoral one, something that still frightens some more conservative audiences. It's this amorality that givesNicolas Winding Refn's film a disturbing edge, much down the filmmaker being of a different nationality and thus not familiar with Bronson's exploits as many Brits. So much of its success comes down to the awesome central performance by Tom Hardy, best known previously for his role in RocknRolla. To say be embodies Bronson is not taking it too literally. Hardy had 'an unhealthy obsession' with the man and visited him in prison numerous times. He also went on an intensive training course to bulk up for the role that would put Christian Bale to shame. The result is a career-making performance that jumps off the screen and grabs you by the balls one minute then has you laughing despite yourself at his outrageousness the next. It's pretty unavoidable at this point to see the comparisons with a certain Aussie character played by Eric Bana, and Chopper does have common ground with Bronson. Certainly Mr Read's sentiment of "Never let the truth get in the way of a good yarn" is echoed in some of the more abstract and theatrical scenes. The comedy alongside violence is mixed similarly and the central performance is equally strong, but Bronson owes more to a film like Love Is The Devil in biographical imagery and conceptual surrealist wanderings into the mindset of the protagonist. In fact Refn sights Kenneth Anger as well as the more obvious Kubrick as a principal influence on this work, so the art house feel to the film is firmly self-aware. The supporting cast do their best to not be eclipsed by Hardy, with a couple of wonderfully camp standout appearances from British television comedy actors; Peep Show's Matt King and Teachers' James Lance. The former plays Bronson's fighting promoter he meets in prison, and Lance is the flamboyant art teacher for the inmates – both improvise some fantastic lines, in stark contrast to the less than articulate Bronson enigma. The cinematography by Larry Smith is noticeably affected by his time working with Kubrick, which is no criticism. Some of the more conventional scenes that could easily have seemed extremely dark are injected with an epic cinematic effect that levitates the film out of the ordinary. 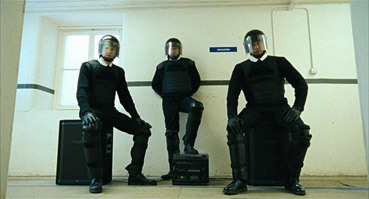 Look at the institution scenes for example – good shooting choices and a wonderful location make some of these scenes the most memorable in the film. Couple this with an eclectic soundtrack of 80's electric pop and classical and sound and vision are married to create a skewed portrait of a man who desperately wanted something but was never sure what it was. It is ultimately a darkly comic tragedy in the creation of a national personality who in this metamorphosis has become ironically and literally shut off from the people he has influenced and entertained. There are so many moral grey areas and contradictions in this story that it makes for a fascinating focal point. The issue of screen violence is always a contentious one, and one that will always divide audiences – just look at the stir Lars Von Trier's Antichrist is having at the moment. But this low budget tour de force has so much more to it than tackling the issue of violence, if you look a little deeper and don't get blinded by the surface as some critics have done. Well, that's my humble opinion anyway! The 1.85:1 anamorphic transfer reflects an almost schizophenic approach to the visuals, having the careful composition of Kubrick but a gritty graininess of vérité documentary, an approach the film shares with its prison movie cell-mate Chopper. Like Andrew Dominik's film, the colours have also been visibly tweaked in post-production. Within this stylistic framework, the transfer is a solid one, coping well with alterations to the colour scheme and particularly the red saturation of one sequence, which the blacks remain completely solid, particularly important in the stage performance scenes. Detail is good, but occasionally softens when the grain gets busy. There's a choice between Dolby surround 5.1 and Dolby stereo 2.0 soundtracks, with 2.0 winning out on volume but 5.1 proving a more subtle experience and reproducing the music with more bass and finesse. There is clear separation at the front, but not too much going on at the back on the 5.1, the appleause of the theatre audience being the most noticeable. The director's commentary is a very comprehensive one, in interview format with Alan Jones posing questions to Refn. They discuss many things, from the concept of the film and its unconventional biopic nature to its unbiased approach to a British cultural figure. Jones primes Refn with good questions and the director is articulate and intelligent. They also bring up interesting points on the element of fairytale often not picked up on in the movie and its slightly circus like feel on occasion. We also find out the effects that Bronson has had on Refn's forthcoming film Valhalla Rising, as well as plans he has for working with Tom Hardy again on an Alistair Crowley biopic! That will be one to look forward to. The Making Of (15.23) is reasonable yet too short and offers little that the commentary doesn't cover, though it's nice to hear from Tom Hardy about getting into character for the challenging role. Charles Bronson Audio Introduction (16.06) is the same recording played at the film's premiere and is quite something to listen to. The intensity of it is somehow exaggerated by the lack of visual accompaniment and hearing the gritty southern drawl of the man himself is must more effective after watching the feature. Tom Hardy: Building the body (5.48) is fascinating – it is nice to see a feature about the physical preparation of an actor included on a DVD.. The way in which he was trained was to emulate Bronson's own sparse environment, which consisted of very basic and primitive work-out routines and a high calorie diet. Hardy and his trainer are informative and the footage of Hardy partaking in these workouts shows the level of commitment he must have shown. The other stuff is the usual TV spots and trailers, with an intriguing trailer for Valhalla Rising tagged onto the end. If Bronson is anything to go by then this Viking follow up should be something to watch out for! An interesting film about a complex and enigmatic character that will remain a talking point for some time to come. 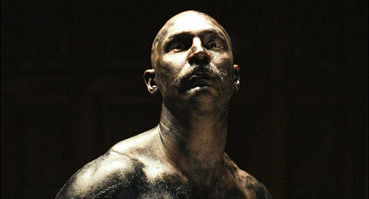 Love it or hate it Bronson is a film worth seeing for Tom Hardy's fantastic performance alone, and definitely benefits from multiple viewings. Sadly it is probably too unconventional to achieve as many accolades as it deserves, but such controversy surrounding it, at least for the man the film is based on, is reward enough!